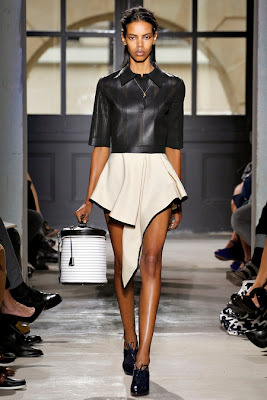 The moment Canadian model Grace Mahary stepped onto the runway as an exclusive at Givenchy's Fall/Winter 2012 show, I knew we were in the midst of witnessing the birth of a new modelling star. Inoubliable Model Army featured Mahary in its list of Top Ten Newcomers for F/W 2012 based on that singular runway "exclusive" appearance and she has delivered on that initial promise with a stellar Spring/Summer 2013 season, racking up a 29 show tally with appearances at Prada, Louis Vuitton, Chanel, Balenciaga and Saint Laurent. Twenty-three year old Mahary was born in Alberta, Canada and owes her distinctive exotic looks to her Eritrean heritage. Modelling since 2006, Mahary has certainly earned her stripes, displaying a humility, appreciation and well formed insights into the machinations of the industry. I encountered the super excited and animated Mahary at the fittings for Oscar de la Renta during the Spring/Summer 2012 season and was immediately charmed by her effervescent and sweet nature. Mahary is quite simply a standout, she possesses a unique and captivating look that is melange of old world elegance and youthful vitality. What seals the deal though for Inoubliable Model Army is Mahary's equally beautiful and enquiring mind that serve only to magnify her physical beauty. Mahary took time out over the holiday season to get Inoubliable Model Army up to speed on her whirlwind month of fashion hijinks, and shared her thoughts on the power of "exclusives", her love of sport and the foundations that keep her on solid ground. Inoubliable Model Army: Congratulations Grace on a phenomenal Spring/Summer 2013 season! This was your first full show season, did it live up to your expectations and how are you feeling now that you've had the chance to unwind from the shows? GM: Thank you! I couldn't ask for more in a season, let alone my first. Post-fashion week time has given me the opportunity to soak in and appreciate what happened in that whirlwind month. Inoubliable Model Army: You possess one of the most distinctive and original faces in modelling. In fact, you remind me of a model from the 90s called Anna Getaneh. Do you know of her, if not google her name! GM: Wow, that's a humbling compliment as I also consider Anna a portrait for strong independent humanitarian women. Inoubliable Model Army: How were you discovered and had you always harboured modelling ambitions? GM: Oh gosh, I don't even think I knew what modelling was growing up. Avid basketball player, science lover, and to my mother's distaste, a tomboy, I disregarded all modelling offers for years. It wasn't until Elmer Olsen discovered me while on a family trip in Toronto one Summer that I gave in. Inoubliable Model Army: You've been modelling for a while, since 2005, more so on the commercial side of modelling with editorials in Canadian Elle, Cosmopolitan and an appearance in a Trey Songz music video. How would you describe your modelling journey and and at what point did things change for you? What do you feel has been fundamental to you breaking through to modelling's major league? GM: The journey has been quite a climb and I'm grateful for every step. Once I decided to give modelling a full-time chance, I started travelling the world. The major breakthrough and turning point in my career was walking for Givenchy exclusively. Inoubliable Model Army: How was the casting process for Givenchy, what was involved, did you meet Riccardo Tisci, and at what point did you realise the significance of this moment? GM: Well, I almost got lost on my way to the casting! Luckily I found it, entered and heard Kanye booming from the room in which Riccardo Tisci was waiting. I think at that point I was more excited to rap lyrics with Riccardo than to walk for him! Haha... It was pretty immediate how important the Givenchy moment was for me. Actually, it was probably my agent's screaming excitement that drilled it into my head. Inoubliable Model Army: There has been some criticism of the power that casting directors wield with regards to "exclusives" and the effect both positive and detrimental, that this may have on a new model's career. What are your thoughts given that models can often be held on an exclusive option for an entire show season only to be dropped at the eleventh hour on the day of the show? GM: It's terrifying because you place all of your eggs in one basket and hope that it doesn't tip. Although next season may seem like an eternity away to a new face, one has to remember that fashion is fickle. At the rate it changes, alternative opportunities arise and models should find comfort in knowing that there are other career routes than those fixed in their minds. Inoubliable Model Army: You appeared in many incredible shows this season, most notably closing for Hedi Slimane's debut collection for Saint Laurent. When did you find out that you would be closing and how was the experience? GM: I found out 2 seconds before I walked out in last gown that I was closing. It was such an exciting and dramatic experience. Inoubliable Model Army: Was there a particular show that holds special meaning to you, this will be a tough call I'm sure given that you walked for Prada, BCBG, Givenchy, Balenciaga and Chanel to name but a few. Was there a collection that you particularly loved? GM: Tough indeed! Being part of the last collection by Nicolas at Balenciaga was an honour. I love everything ethereal, sporty, and geometric about his work. Inoubliable Model Army: The show season and castings can be a pretty stressful, intimidating, exhausting and exhilarating period. What was your approach coming into castings and how did you cope with the rigours of your first full show season? Were you able to form any close friendships with any models in particular? GM: Excited, it was my first full season! Prior to that, there were only basket ball and weather seasons in my life. I looked forward to defining a fashion one. Of course, cracking jokes daily with Anmari Botha, my Kiwi, kept thing's light. Great friend and sense of humour! Inoubliable Model Army: Fashion can be pretty unpredictable and casting trends even more so. Did you notice any discernible casting trends this season and do you feel that diversity in modelling has improved in general? 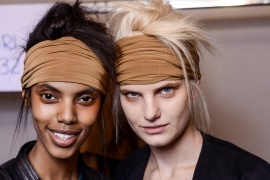 GM: It was stunning to see more ethnically diverse talent gracing the runways. Also, I think the trend is leaning more towards mature women, a more relatable female to consumers. Inoubliable Model Army: The opportunities for models of colour tend to be fairly limited. Each season, the spotlight tends to be focused on only a handful of black models. This season, it was yourself, Cora Emmanuel, Jasmine Tookes, and Tsheca White. How do you feel about the industry's often closed door policy towards models of colour and does this effect your psyche when going into castings? GM: The industry has opened the door much more than it was during the Naomi or Beverly Johnson days. For that, I believe it's evolving and use it as motivation going into castings. Change is always on the horizon. Inoubliable Model Army: What do you hope to achieve in modelling and beyond, and do you have any specific goals? GM: In this industry, you meet such a diverse community of individuals; I hope to continue working with such a high level of talented inspiring artists. I'd also love to do a wicked collaboration between sports and fashion. The first Vogue I actually picked up prior to my modelling career was the issue with the Gisele and LeBron James editorial. Mixing the best of my two worlds! GM: Fighting the preconceived notions people have of models. No, I'm not perfect, and why, yes... Yes, I can read. Inoubliable Model Army: Which facets of modelling do you enjoy the most and do you have a preference for runway or print work? GM: Film work. Motion expression is energising. It's the balance between the fast pace shows and the intimacy in shoots. Inoubliable Model Army: What do you feel are the biggest misconceptions about models and the industry in general? GM: That everything is va-va-voom glamourous in our lives. Considering all the time we spend on flights and in hotels by ourselves, it becomes a lonely job. Inoubliable Model Army: Meeting you at Oscar de la Renta was so great, you were so open, friendly and engaging. How do you manage to remain grounded in an industry where so much emphasis is placed on physical beauty? GM: Good question... I guess love and relationships were always the root of my character. Focus on my looks now, but that doesn't change what my soul has always found attractive. GM: I'm Grace. Here to grace your heart, eyes, and mind. This interview has me even more in love, she sounds like a smart girl with a good head on her shoulders. Can't sing enough praise for your blog, keep up the incredible content! Thanks Kate, I appreciate you supporting Inoubliable Model Army. Grace is indeed an extraordinary model and human being. It was pure joy to collaborate with her on this post!